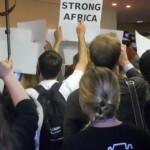 Mic Check: Protesters take up camp inside COP17 conference centre - Climate Justice Now!Climate Justice Now! 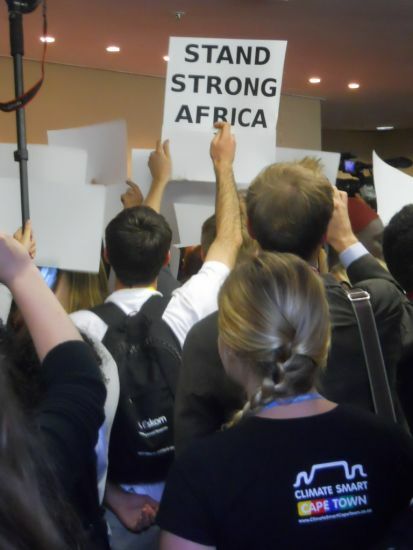 At 15h00 local time in Durban, SA (8am EST), dozens of protesters gathered inside the International Conference Centre where the COP17 negotiations are entering their final hours. Protesters have said they are prepared to stay all night, and that they will ensure their voices are heard. They are calling for the World Bank to be taken out of climate finance, a reference to the predominance of private financing and market mechanisms in all funding solutions for climate change reduction projects being discussed at the conference. A central piece of what is being negotiated in Durban is the Green Clmate Fund, with a goal of raising $100 billion for adaptation and mitigation projects. Most of the funding is being linked to programs like carbon markets and offsets, which critics say allows companies to continue polluting and ignores the need to drastically reduce our use of fossil fuels, and not simply try to offset them with other projects. UPDATE: The protest is down to two people. After a decision was taken to sit down and not leavve, a separate proposal was made encouraging people to hand in their accreditation in protest. Many protesters, when asked by security, got up, turned in their badges and left. More details soon. UPDATE 2: The protest finished early in the evening, with the last two people participating being removed by security (one being carried out). Both were stripped of accreditation, but were not detained. They both went to the Speakers Corner outside the conference centre, where protesters are participating in an all-night vigil. This entry was posted in Climate Debt, Durban / Mobilisations, Finance, Worldbank out of Climate Campaign and tagged Green Climate Fund by admin. Bookmark the permalink.